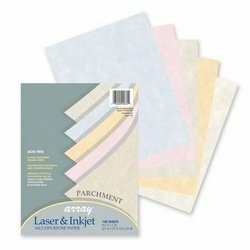 Pacon Assorted Multi-Purpose Parchment Bond Paper measuring 8-1/2" x 11" is designed to use with laser and inkjet printers. This acid-free 24 lb sheet has classic parchment which adds grace to certificates, awards, announcements, calligraphy and presentations. Sold as 100 per pack.